There is something very satisfying about clearing off the needles and finishing up projects that have languished a long time. One of those projects is this one but not because it was on the needles for eons, mostly it is because it took a long time to spin, ply and finish. This project lasted almost a year. I started spinning it last Fall (October 2015) and finished the spinning in April 2016. 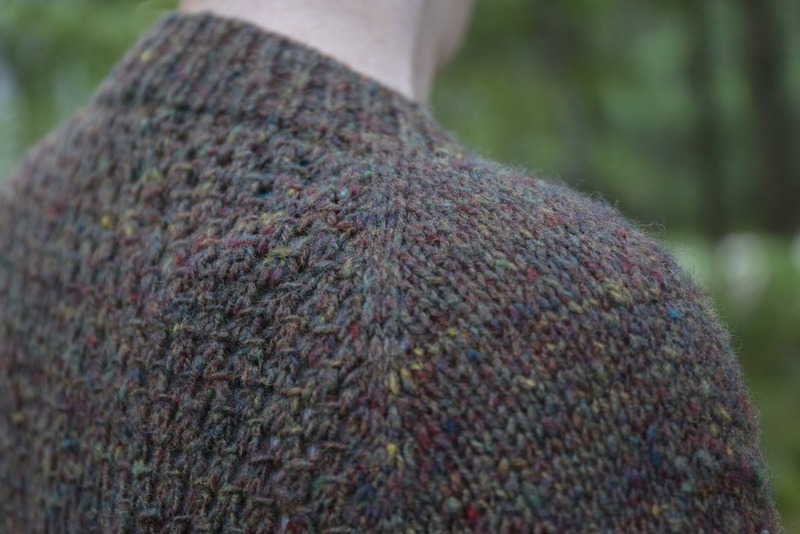 You may remember that it was a challenging spin to continue pushing through for many reasons that I have shared so to finish the sweater and be able to actually wear this mammoth of a project? It feels so good. So, so good. As I cast off the last stitch of one of the sleeves, I literally breathed out a sigh of relief. Knitting with this yarn was a lovely experience. I must be totally honest and admit that I did constantly pull out some of the neps that were hanging on for dear life. After washing, the fabric has a lovely drape, feels soft next to my skin (which one would expect from Falkland) and fits beautifully. While I have many feelings towards this sweater, I don’t have much to say. 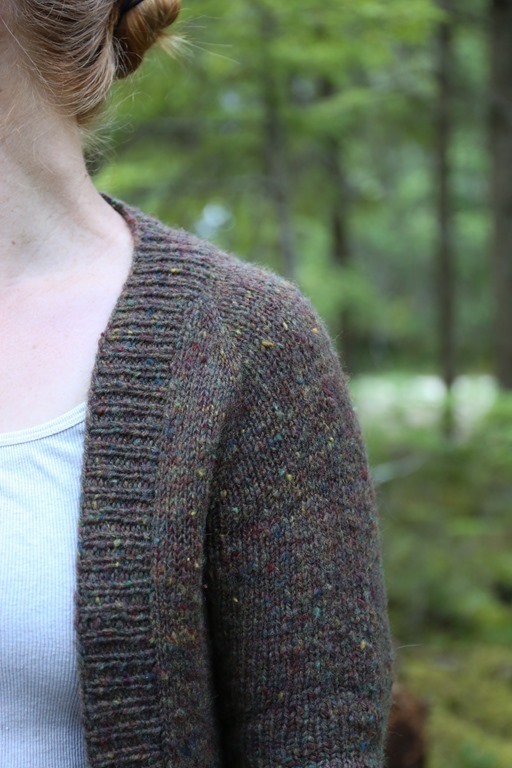 Obtaining gauge was difficult so rather than make myself crazy, I utilized a top-down recipe as I did recently with another cardigan. 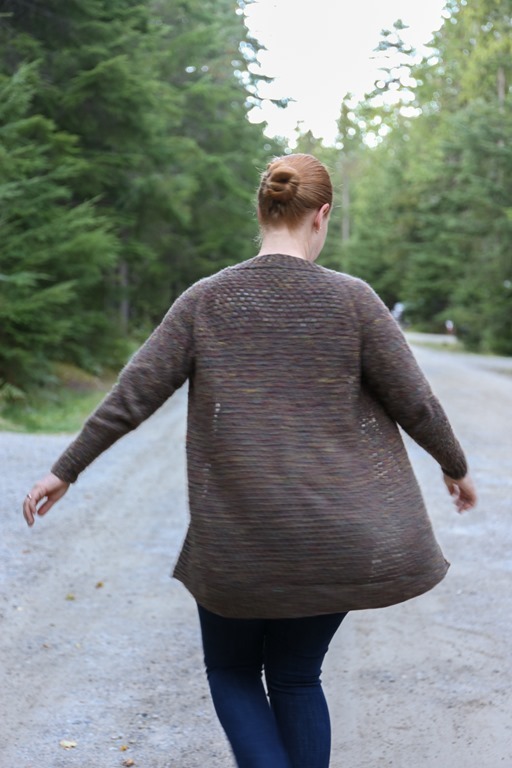 I plugged in the stitch pattern for Vermont by Hannah Maciejewska that I had originally planned to knit – purchasing that pattern was worthwhile in the end since I got the stitch pattern! 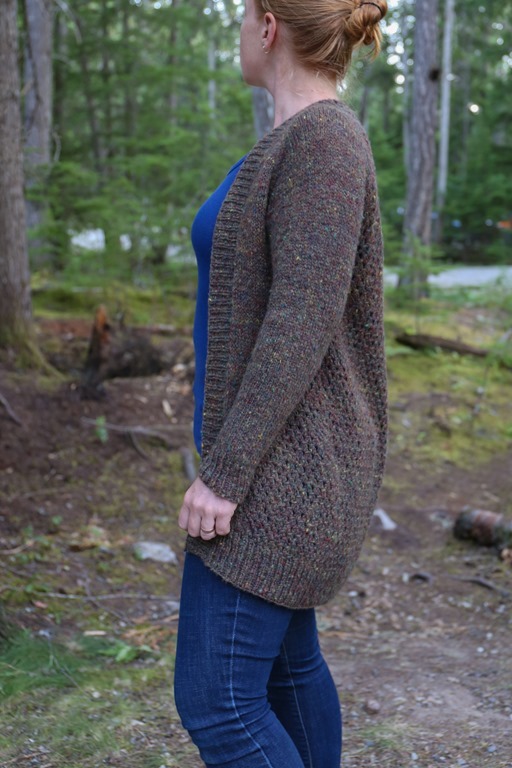 I used the stitch pattern to create an A-line shape that moves outwards towards the front of the cardigan, making room for my hips and creating an oversized shape. I’m actually not completely sure how many yards of yarn I ended up with in the end since my yarn counter broke and I didn’t have a skein winder prior to knitting with this yarn. It was too much to wind off on my niddy-noddy and obtain an accurate measurement. 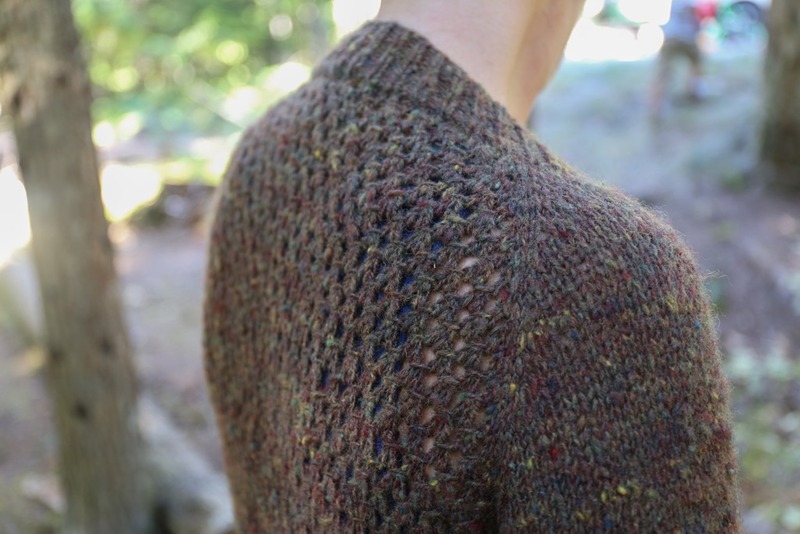 Regardless, I knew I had enough for this sweater and in the end, I have two skeins left (much to my displeasure – I was hoping to use it all but I couldn’t make it any longer!). Because I knit this sweater with a significant amount of ease, I’m envisioning wearing it with a scarf and skinny jeans. I can’t wait to see how this yarn wears! I’ll keep you posted. Have you finished a mammoth project recently? Please share your results with us! Rachel, this looks absolutely fantastic and because it took you a year to finish, you are making me feel better about my mamooth project. About a year ago, I bought a raw fleece from a local to me wool fair. It is a white Ryeland fleece. It did not cost very much, but needed a lot of work. I sorted it, washed it, carded it, and then decided that because it was cheap and not that exciting, I would use it to teach myself to spin English Longdraw (woolen). So I made rolags with my handcarders. My first efforts at spinning were lumpy and bumpy, but I eventually got the hang of it. I made a sample skein (as per your video) and am now in the process of finishing the spinning. As I have only got four bobbins with my ladybug, I am plying as I go, which is not ideal. 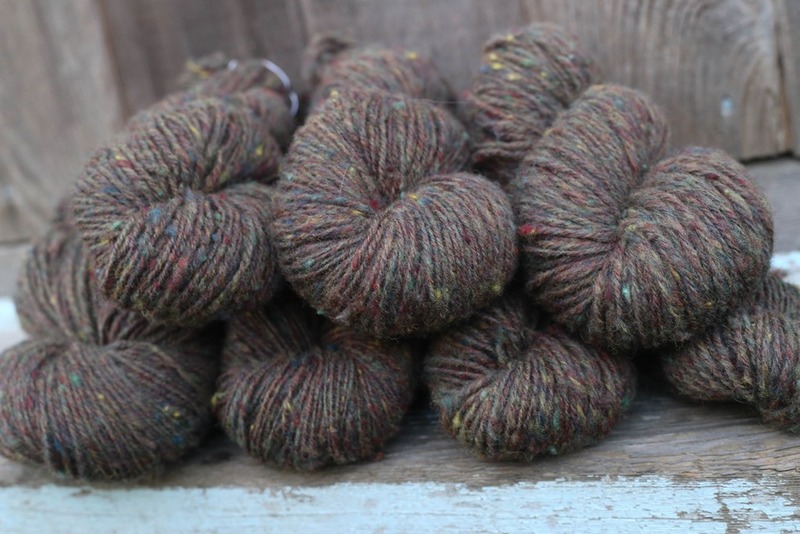 I am ending up with a very lofty two ply yarn, DK’ish weight, which I will probably use to knit a hap out of. After a break in the summer, I am back making rolags in one last effort to get this finished. Thank you for making me feel better about the time it is taking. I think these larger projects are hard to stay focused on and sometimes we need to take breaks from them! Keep at it – you’ll be relishing in your efforts when you are knitting your hap, which sounds amazing! Good luck! Beautiful! I appreciate the comments about how long it has taken. I’m learning to be more patient about the process of spinning to knit. Wow, it’s absolutely gorgeous! Bravo! That is such a serious work of art – both in the spinning and execution of the way you have designed the cardigan incorporating different patterns. Definitely a piece that anyone would be proud of owning, let alone wearing. So impressive! Beautiful job Rachel! It makes me want to get on my sweater spin that’s been languishing for a couple of years now!! Such a gorgeous sweater! You done good – it was worth the time and effort you put into it. Now wear it proudly! 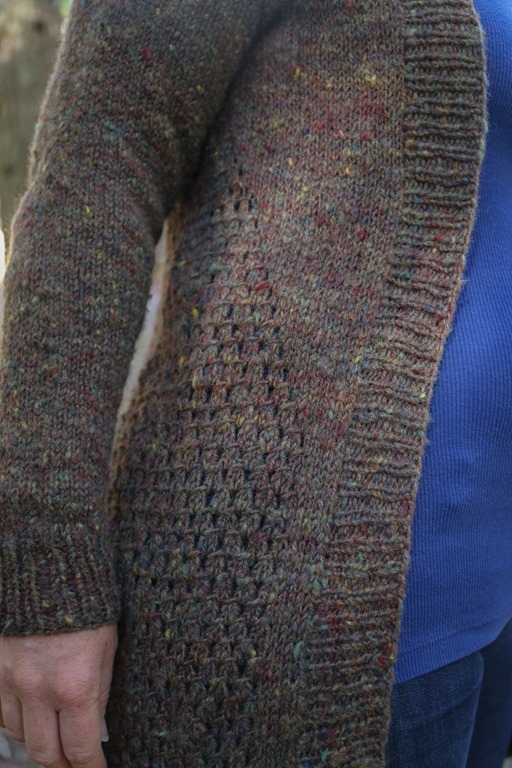 I too just finished a sweater that took 6 months from wool prep to final block, Intersect pattern by Norah Gaughan. Slow Clothes, right?